For more than three months I have been living out of a suitcase in India, the land of my ancestors, which I was made to hate by the leaders of the country where I was born — Pakistan. I am in India researching and writing my next book, The Hindu is Not My Enemy. On Sunday, I performed a political pilgrimage. 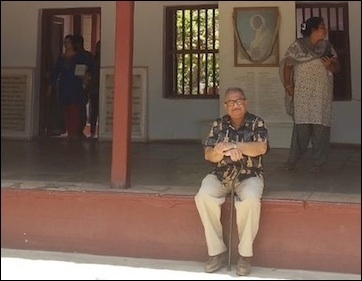 I travelled to the city of Ahmedabad in Gujarat to the home of the man whose name I have carried as my nickname since I was 10 — Mahatma Gandhi. Gandhi lived in an "Ashram" on the banks of the River Sabarmati for 12 years after returning to India from South Africa in 1915. This is where he developed his ideas of non-violence, self-help and campaigning against "untouchability", alcoholism, ignorance and poverty. And this is where he led Indians to challenge British colonial rule with a 400-km "Dandi" (walking stick) Salt March. Gandhi and I have had a 60-year relationship through our names. It began when I was barely 10 and my maternal grandfather nicknamed me "Gandhi" because, or so I was told, I was as thin as a "dandi" and wore thick eyeglasses. What would Gandhi make of the threat posed today by Islamic terrorism to his India and the world? As a child, I was surprised when my Pakistani classmates mocked me when I proudly disclosed my nickname. I was beaten and shunned for no other reason than the fact I was as fragile and ghostly in appearance as Mahatma Gandhi, whom almost everyone in Pakistan hated. It wasn't until I left school for college in 1965 that I got to study Gandhi's history. That year, there was a war between India and Pakistan and all the students were riled up against the "evil Hindu sons of Gandhi." I too was drawn into the jihadi hate fest of non-Muslims that swept the country. In 17 days, Pakistan's attempted invasion of Kashmir by soldiers dressed as civilians was thwarted by India. The Soviet Union then bartered a ceasefire. The fact Islam's armies could not win against the supposedly "cowardly Hindus" and that godless communists had to intervene was a rude shock for many of us. But I took it seriously. It dawned on me that mixing religion and politics was a mind-numbing, hate-inducing intoxicant that needed to be fought. But who was our enemy? And why were Muslims so angry with Hindus, despite being fans of Hindu film stars such as Raj Kapoor and Vyjayanthimala? To understand our "enemy" I picked up two books from my dad's library: The Discovery of India by Jawaharlal Nehru and The Story of My Experiments with Truth, Gandhi's autobiography. As for Pakistan's side of the story, I was shocked to learn that the founder of the country, M.A. Jinnah, had written nothing, not even a letter to the editor in all his life. No essay, no biography, nothing about peace, war or secularism. Thus began my 50-year journey that culminated on Sunday at the footsteps of M. K. Gandhi's home, where I sat on the floor of the "veranda" (porch) and let my thoughts wander into the skies over Gujarat, wondering what "Bapuji" (Gandhi's nickname) would make of the threat posed today by Islamic terrorism to his India and the world.